Next to the beautiful bluebell woods at Arlington in Sussex, which I visited over Easter, there is a wood full of wild garlic. Now, you might think that wild garlic isn't quite as attractive as bluebells - or as pleasant smelling - but it is still a very important wild plant. Actually, several different plant species of the genus Allium are known as wild garlic. 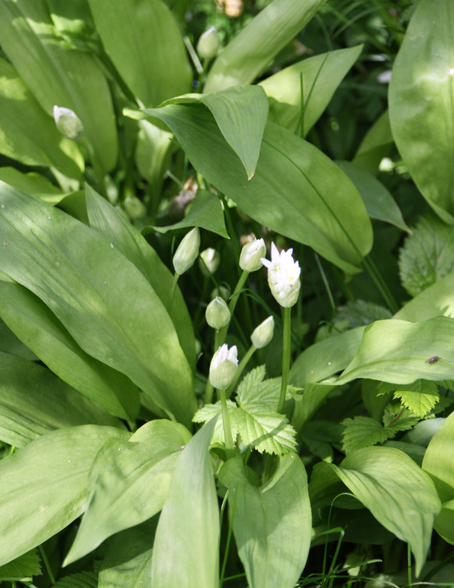 The type in my photo - taken at the Arlington wood - is Allium ursinum, which is also known as ramsons. The leaves of ramsons are edible and, as you might imagine, taste of garlic. They can be put in a salad, boiled as a vegetable or used to flavour soups and stews. If you are foraging for wild garlic, do be careful to identify them correctly as the leaves are similar to some poisonous plants, including Lilly of the valley. According to the Woodland Trust, ramsons are an ancient woodland indicator - meaning that this species can be used to aid identification of ancient woodland sites. Ramson bulbs have been used in herbal remedies as tonics to relieve rheumatic problems and lower cholesterol. According to folklore, eating wild garlic is also good for the digestion. Note: This is intended as information only, not advice. Always consult a qualified expert before taking any herbal remedy.